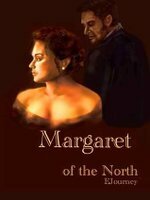 Margaret of the North is not so much a continuation of Elizabeth Gaskell’s North and South, but a continuation of the BBC series portraying Richard Armitage and Daniela Ashby. This means the book starts with Mr. Thornton and Margaret’s reunion at the train station, and it is very interesting to note that the beginning of the book is not overly romantic with all the emotion display one would expect, it resembles very much Elizabeth Gaskell’s writing style and that is something I appreciate, it is in fact the most similar in style to Mrs. Gaskell that I have read until today. The book continues with Mr. Thornton and Margaret’s honeymoon to Paris and subsequent travel to Cadiz to visit Frederick. It is a slow paced book and I kept waiting for something to happen but it never did, so with time, the book became less interesting for me. I never felt a true emotion while reading it, and even if this is an extremely subjective argument, for me it is essential to feel something while reading a book. I also had some difficulty in identifying with Mr. Thornton. It was strange to see him so unpreoccupied about re-opening the Mill, and at times his speech seemed more like a speech Mr. Darcy would have. In this book John Thornton was too sure Margaret would accept him, and that he became a better person after her refusal. For me this is a description of Mr. Darcy and not Mr. Thornton who never believed such a woman could care for him. Despite this fact, I believe the author was successful in showing us the class differences that existed at the time, and how Mr. Thornton learned from his experiences and changed his perceptions on how to improve the workers life conditions. Margaret of the North is very descriptive, and for those who like this type of writing it will be very appealing as we get to read everyone’s opinion and perception on almost all subjects, but to me it felt too slow paced and lacking emotion. The book slowly describes the changes in the characters’ lives after John and Margaret get married. It gives us an interesting view of Margaret and Hanna’s relationship and the impacts that living with one another has for these characters. It makes us see and understand how Hanna suffered with this situation, and how all the changes had a big impact in her daily life and therefore in her disposition. This is not a book of action, it is a book that gives us a more intense view of the characters’ lives after the wedding, their feelings and inner struggles. It leads us on a path where we focus on their personal growth and not on the story itself, so it might be an interesting read for those who want to analyze the development of these characters. Your description leaves me not especially wanting to read this as I have read other variations (some unpublished) which are full of love and romance. Long descriptions sometimes put me off. But thanks for sharing your review so we are not only aware of this book but know your opinion. I’ve read worse N&S books that I definitely do not recommend Sheila, and I would not go so far as to it recommend this one, but I’ve also read much better. This one is not a bad book, but not my cup of tea. I found it too slow paced, and all the analysis put me off too. I prefer to feel the romance :)) But the writing on this book is good, and it might be more appealing to other readers than it was to me. Thanks Rita for not being afraid to post a review that expresses reservations about a book you’ve read. I have to confess that I was a bit dubious when you said right at the start that it was a continuation of the dramatisation rather than the novel. Don’t get me wrong, I love the BBC drama and especially Richard Armitage’s portrayal of John Thornton but I like my fan fiction sequels to follow on from the book rather than a drama. Maybe that’s just me being picky but there it is. I’m going to get the free sample from Amazon and make a decision after that. I am actually ok with both continuations Anji. I love to read more about the train travel and the conversation in London, and I’ll say that the beginning of this book was very close to Gaskell’s writing, and I enjoyed that very much, but it’s true that I was not utterly in love with it and I had to be honest about it. But like said, I know some readers may like this book. I am curious to see what you think of the free sample. Let me know! acceptance ? And this is a N&S variation? Are we speaking of the same book? I must agree with your view that he believed himself never good enough for her and lamented that she could never care for him. I must applaud your honesty for writing of your qualms concerning the storyline and having read your review,must admit that I don’t think I’ll be reading this book. Like you,I’ve read other N&S variations and although their path to a mutual understanding is oft times troubled and uncertain,it is always peppered with beautifully romantic episodes when they finally realise their perfect partner in life has been the one they’ve been sparring with,avoiding and unconsciously awaiting for weeks!! We’ll done on your review,Rita. I enjoyed reading your thoughts and appreciate your honest efforts in expressing your concerns. A low angst that is too devoid of some action would get boring especially if the romance was already fully developed and offered no flaws and need to grow. Sounds like an interesting daily journal full of their travels and daily life rather than a story. Might read it eventually. I still have one more Nicole Clarkston on my shelf before I go looking for a new NSFF to read. Hi Rita! I thought this was a great review and I just wanted to compliment you on it, because I know how hard I often find it to pin down just what it is that has made a story not work for me, and you need to do that to write a fair review of something you’re not feeling the love for. Like Anji, the fact that it follows on from the adaptation would be a strike against it for me too, because then it becomes fanfic of an adaptation (or fanfic of a fanfic!) rather than NSFF. Plus I am one of the few people who prefer the book ending, as I find the train station ending out of character.